Need a Last Minute Father’s Day Gift Idea? Duct Tape Wallet! It’s just days before Father’s Day and the kids and I were scrambling! What do you get a guy who doesn’t need ties, wrenches, or the latest crime novel? My dear husband wanted needed a wallet and I remember asking the GeekMom ladies, “How can we geekify that?” In addition to the multiple homemade duct tape wallet instruction links, someone had pointed out the Mighty Tyvek Wallets such as those featured at ThinkGeek.com. My husband has some specific standards in his wallet choices. He’s had the same sorry Velcro wallet for the past 5 years and it looks simply awful! But he likes the numerous credit card pockets, and he says that the pockets are nice and snug. So we set forth looking for a guide to a duct tape wallet that included multiple credit card pockets. We didn’t have to look far. WikiHow had a great set of instructions that worked modularly: You could craft a basic wallet, and then add on the credit card pockets, clear-window ID holder and there were even instructions on how to RFID-proof it! With Duck Brand’s fantastic selection of collegiate duct tapes, it was easy to hop on Amazon.com and place an order for — naturally — Penn State Duck Tape. The original plan was for my two sons, ages 9 and 7, to do this gift for their Dad. After all, what better gift for Dad than a wallet that the kids MADE, right? I think I might have been asking too much: My youngest son kept sticking the tape to itself, rendering it useless. So he was put in charge of measuring. He’d lay out the ruler and we’d stretch the tape next to it. My oldest could cut tape and make the sheets of duct-tape “fabric” that ultimately get folded into pockets and the wallet itself. But he isn’t very precise, so many of the folds and cuts were crooked. I had to provide a LOT of guidance…. You know what’s cool about this? 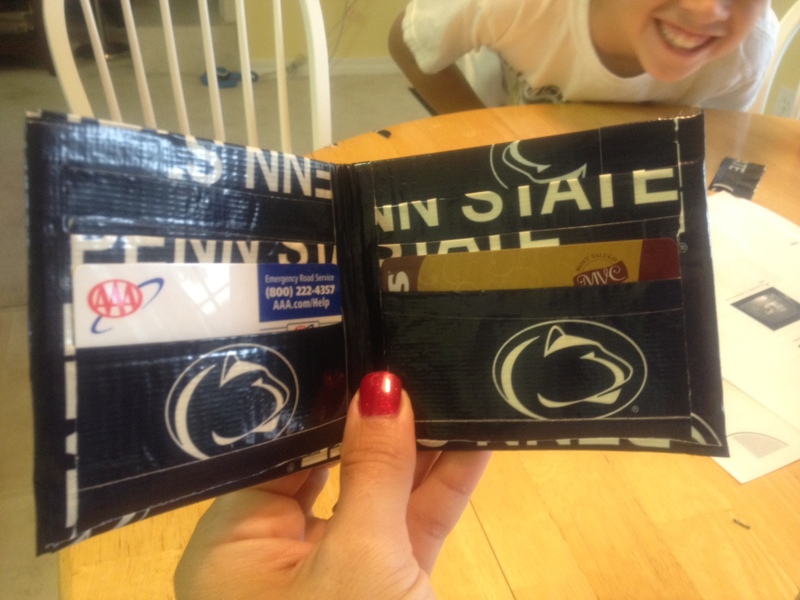 If you don’t like the edge, or (in our case) we wanted a Penn State emblem to show face up, it was easy to just rip another piece of tape and overlay it onto the wallet. Our entire project took about 120″ of tape, plus some extra for the mistakes and my youngest son’s mishandling. One roll of the specialty tape (10 yards) was more than enough. A $5 wallet! We’ll let you know whether Dad likes it! If not, it’ll be easy to make one to his liking. We might just have enough tape left to do another one….